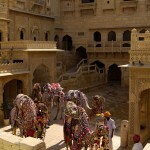 Ready for an adventurous Camel Safari in the Thar Desert of Rajasthan, I was awaiting an overwhelming experience. It was my first camel safari and I was pretty excited about it. I and my guide Pradeep set out on a safari in the evening as during the day I was scared to get evaporated by the scorching heat of the sun. Jokes apart, in the evening when the sun is down you can enjoy riding the camel. I took some time to get used to the camel ride. 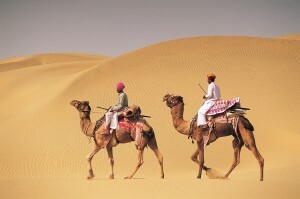 Trotting along the Thar Desert where sand dunes look like small golden hills is truly a great experience. I simply loved the ambiance. It was so romantic. It seemed as if everything was in perfect harmony with each other, irrespective of their different individual identities. The view of the endless stretch of sand dunes is truly picturesque. I clicked many pictures to make my own record of memories, which I can cherish for long. A thought raced through my mind while enjoying the beauty of the desert: What is constant in life? Change. The shades and shapes of these sand dunes change several times in a day and in the same manner our life also changes with time. And the desert accepts the change with serenity, something which we usually fail at. After enjoying sunset in the desert, now was the time to witness the colorful cultural activities on the sand dunes. We were slated to spend a night at the night camps pitched on the unfathomable sand dunes. Reflecting the cultural heritage of Rajasthan, the dance performance was truly mind blowing. At night I along with the other travelers cooked food and relished it under the star studded sky. What a wonderful experience! I experienced so much, I learned so much, I enjoyed so much.